What rate you pay? US bond & mortgage rates. 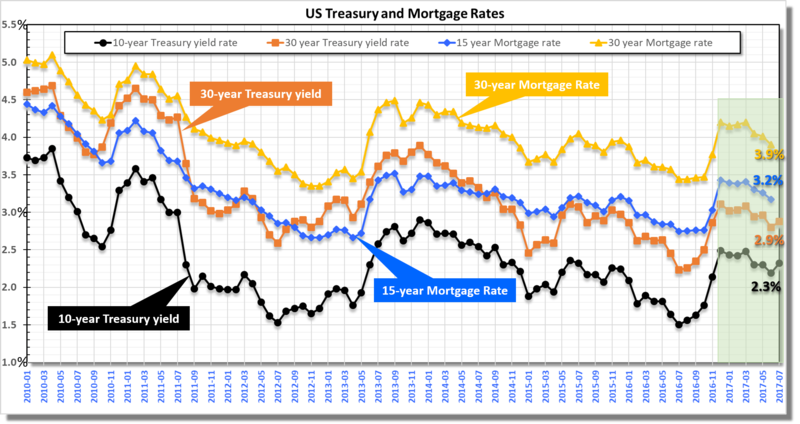 US Treasury bond yield rates and Mortgage rates. We are in historically low interest rates which have important consequences: (1) future returns are most likely not going to be similar to past rates, for pensions, insurances & stock markets; (2) mortgage rates are lowest ever & despite recent increases by Federal Reserve, the 30-year mortgage rate is again below 4% (June 2017). Click to enlarge. Source: Freddie Mac & Federal Reserve. Raw data for this chart are here.